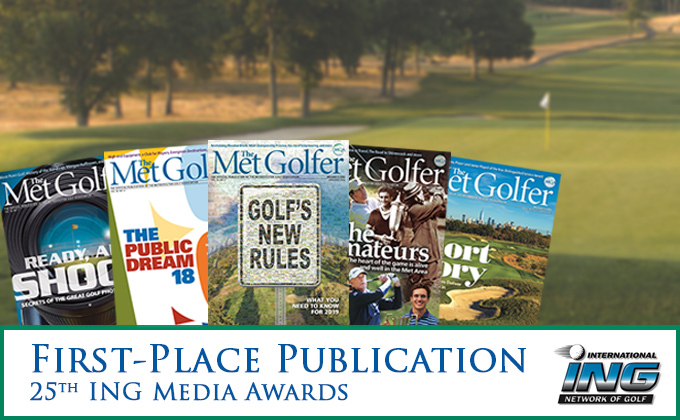 ORLANDO, Fla. (January 24, 2019) – The Met Golfer, the Metropolitan Golf Association’s official magazine, was the leading winner at the International Network of Golf (ING) Media Awards, Wednesday at the PGA Merchandise Show, as it collected nine overall honors including Best Publication. The April/May 2018 issue garnered the Best Publication award, the magazine’s fourth such honor in the last seven years. “Golf’s New Rules” featured an in-depth look at the new Rules of Golf by Editor Jeff Neuman, a glimpse inside the ropes with veteran golf volunteers from Ray Tennenbaum and a Club Focus on Meadow Brook Club’s renovation by Bradley S. Klein. Golf course architect Tom Doak also earned First-Place recognition in Opinion/Editorial for his “Consulting Report: Mission Impossible” column in the February/March issue. The magazine gathered seven Outstanding Achiever pieces, including Ken Van Vechten’s “The Sweetest Sound” in Equipment & Apparel Writing and Bill Fields’ “Doglegs by the Dozen” in Opinion/Editorial, both of which appeared in the April/May issue. Also earning Outstanding Achiever were John Paul Newport in Business Writing for his “Sticker Shock” story on high-end equipment, David Barrett and Hank Gola in Feature Writing for their respective pieces “The Superintendent’s Revenge” and “Mission Accomplished” Club Focus on West Point Golf Course. Editor Jeff Neuman also earned Outstanding Achiever in Travel Writing for his “Myrtle Beach, Seriously” story, while Bill Fields also earned recognition in Profile Writing for his “Novel Approach” story on writer Harlan Coben. An independent panel of three judges in each category determines First-Place winners and Outstanding Achievers. Judges us a point system with several criteria. Scoring is done by judges when possible without knowledge of the person responsible for the work, or of the other judges in the category. The number of Outstanding Achievers in a category is determined by total entries and scoring range in the category. ING is a non-profit, media-based networking organization and conducts the awards program for its membership, which is open to anyone in the golf industry and media. For more information on The Met Golfer, plus digital access to the magazine, click here.